Here it is! Finally sharing some photos of our bedroom with you guys. 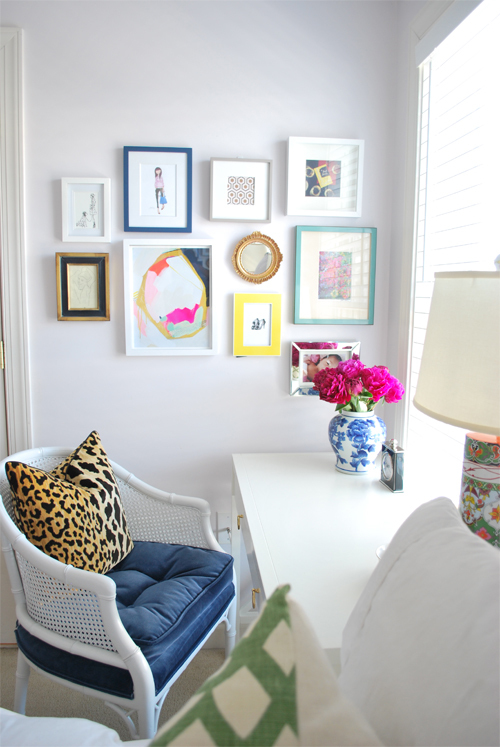 In the years that I've had this blog, I've never shared photos of our bedroom (crazy!) and thought it was time I did just that. Our bedroom has hands-down become my sanctuary, my place of rest ever since Cora came into the world (obviously). Sleep has never been more important to me and having the bedroom be a stress-free space has become my number one priority. I've always wanted to look at our bedroom and say, "wow, what a chic space", and I've never ever said or thought that until now. There are lots of items that I am still procuring for the room (a rug, a new nightstand for Steve's side, a chandelier, and of course a headboard), but so far I think the room is looking exactly like that chic space that I've always wanted it to look like. 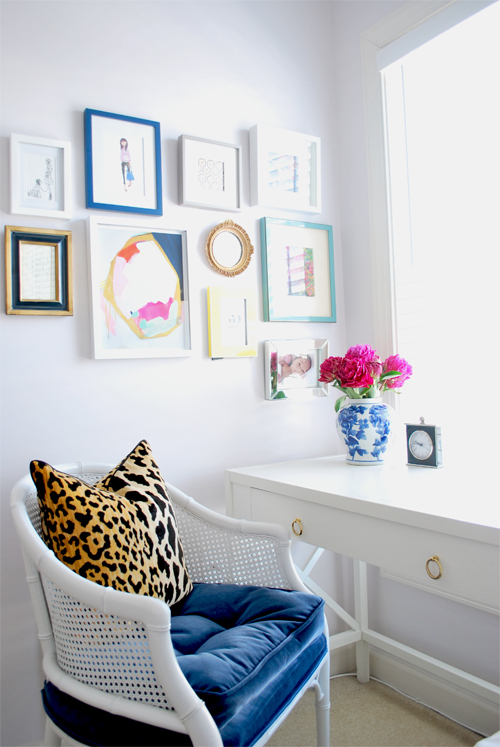 It's serene & clean, but with those pops of color that I just need to have. And it's tidy! Especially my vanity/desk area. I love seeing other people's desks with lots of fun trinkets and books and such, but I've tried having those types of things on there and it just creates visual clutter in my eyes. I just can't seem to work with it and honestly, Cora loves to make a mess of anything I have on there, so I'm keeping it as clean and clutter-free as possible. The room was in serious need of some new bedding so what's a girl to do when that happens? 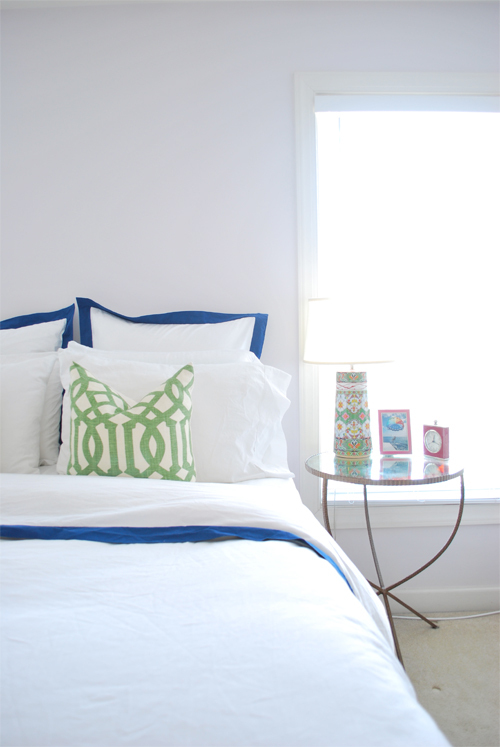 Get help from Crane & Canopy for gorgeous, affordable bedding! 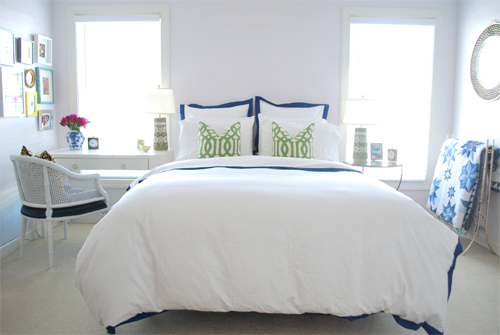 I absolutely love their collections and they generously offered to gift a bedding set of my choosing. 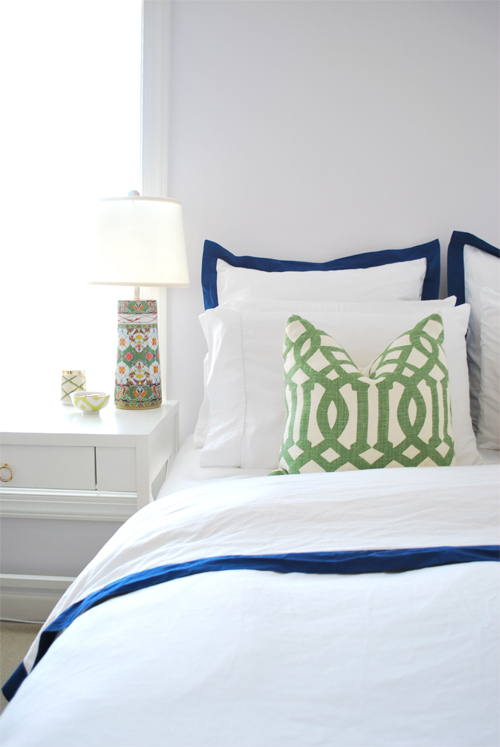 I picked the Linden Monaco Blue Border duvet and shams and I can honestly say that the bedding makes the room. No doubt about it. 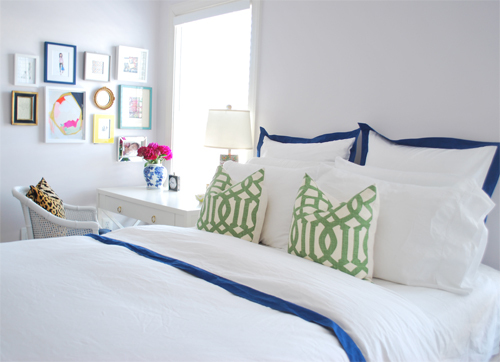 Without it, it just wouldn't have that crisp, clean feeling that I so love in a bedroom. They also offer three other gorgeous color-ways in the Linden Monaco Border duvets along with a huge array of other duvet styles & colors. So the lesson here is that if you need/want new bedding, Crane & Canopy is where it's at. If you don't believe me, check out these photos. As a labor of love, Steve's mom spent countless hours making this gorgeous star-patterned quilt for us a few years ago. 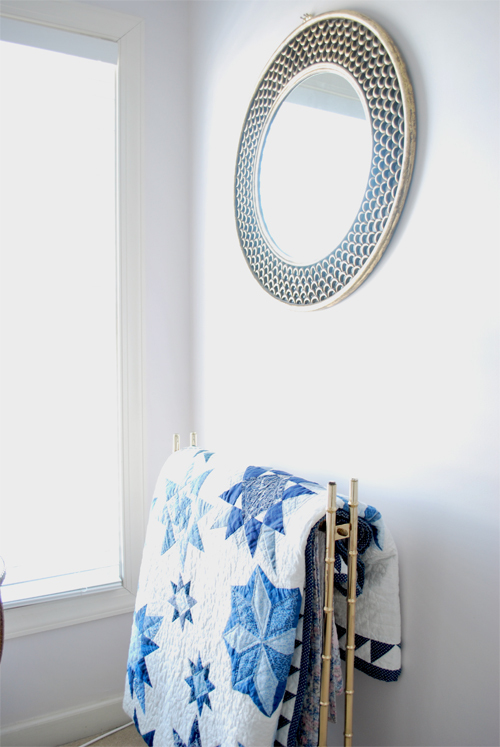 It's composed of numerous blue and white fabrics and fits in perfectly with the room, whether it's providing us warmth at night or perched on the vintage brass bamboo quilt stand. There is a Bungalow 5 console/desk, the Jacqui, that I am in love with, but because of the price tag, it was never going to happen. So I did the next best thing. 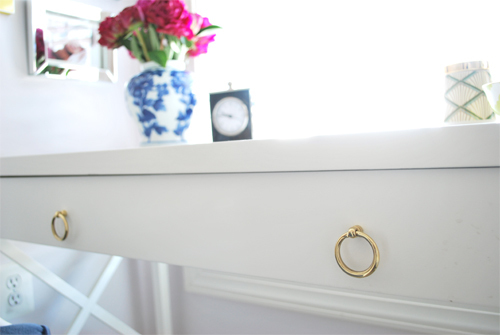 Find a comparable and just switch out the hardware to something similar to the Jacqui console/desk. Resource for the hardware below. So so pretty! 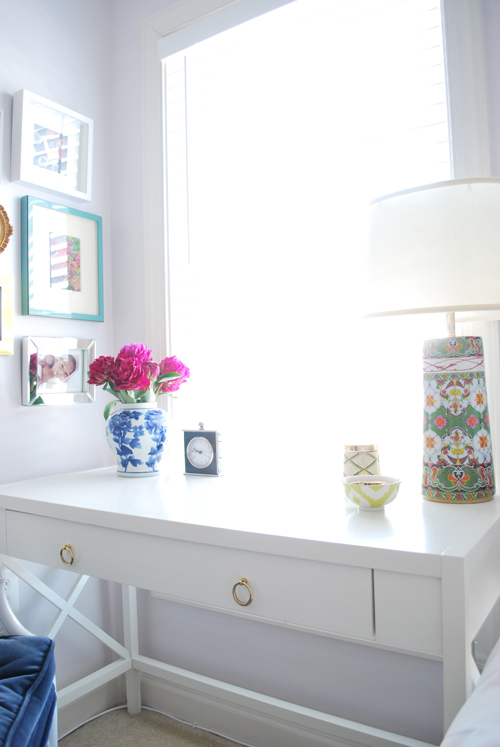 I love how bright and airy the room is!! This room looks so relaxing and serene. 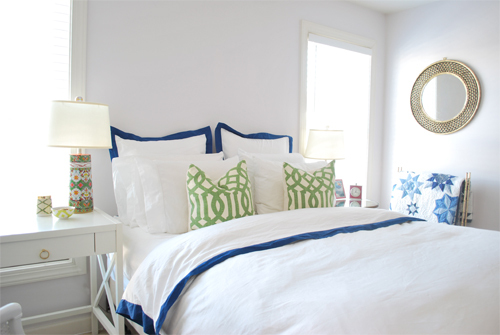 I love the pops of color in elements like the bedding, lamps, flowers, picture frames and that quilt, which is lovely and I'm sure it will be treasured for generations to come. Thank you so much Emma! Yes, we absolutely cherish the quilts that Steve's mom makes for us - they're priceless! Looks great! 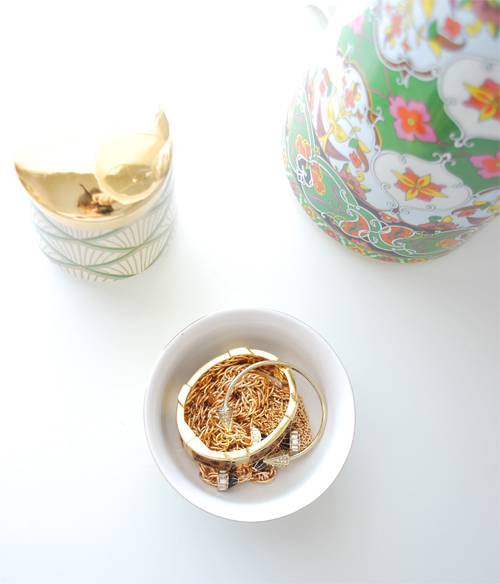 If you have time, check out my new blog - 1inspireddesigner@blogspot.com! Omg this looks amazing Christina!!! Love, love, love. 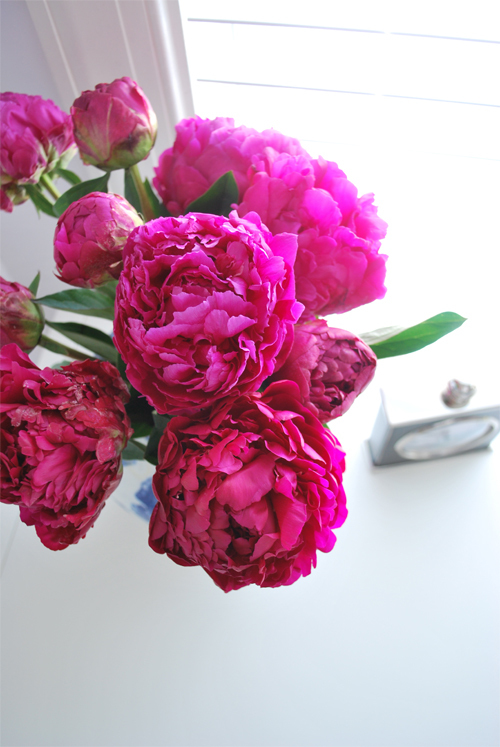 Totally pinning these! What a beautiful bedroom! 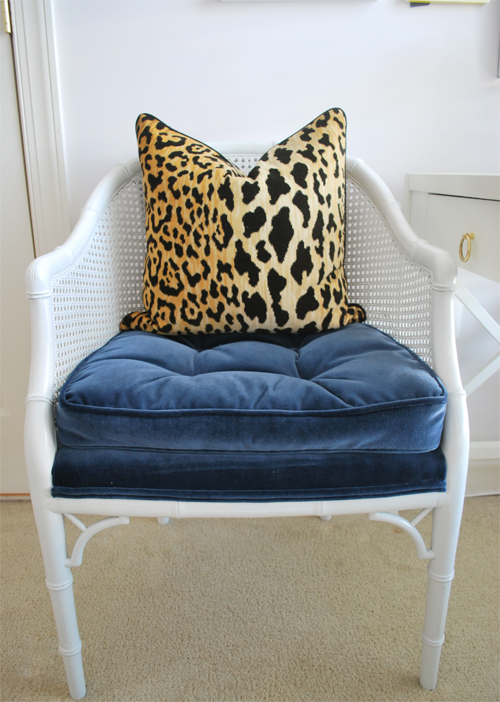 I love the C+C bedding and the leopard pillow! So fabulous. The photos are beautiful as well! Christina, I just love your bedroom. I have an online store in Australia that sells doona covers, quilt covers, quilt cover sets and bedspreads, so I was quite taken by your duvet set. Thank you for introducing me to Crane and Canopy. I'd not heard of them before. I agree with Emma!! There is enough blue and sage green (which I INSIST my nest has--my lil' name for my room) to promote tranquility, but I can't resist a bit of quirky or a pop or colour here-or-there!! This is truly a little sanctuary!! I think I'd enjoy living in this room!! As Brittnay said the room is "Bright and airy." The white also creates that brightness one craves especially during the bleak winter months. Looks like during the day you'd have lots of energy but at night it is simple enough to calm on down. LOVE that there is NO CLUTTER!! KUDOS--I know it must have taken years to find all of the items t make it just perfect but I also can see you just have that style "eye!!" Thank you for sharing and I'm sure inspiring MANY! !